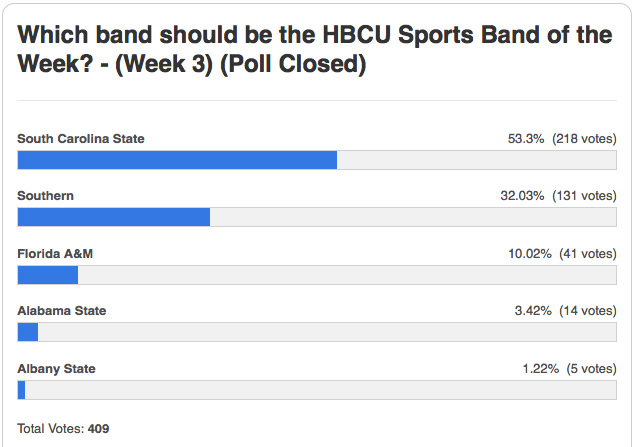 South Carolina State’s Marching 101 was voted HBCU Sports Band of the Week for Week 3. Receiving 53.3 percent (218 votes) of the 409 votes tabulated, the Marching 101 won the band of the week honor for their Sept. 19 halftime performance against Florida A&M in Orangeburg, S.C.
Southern University, ranked the preseason No. 1 HBCU band in America by HBCU Sports, finished second in the polling, followed by Florida A&M, Alabama State and Albany State. South Carolina State automatically qualifies for the HBCU Sports Band of the Year award to be determined in January. This is not about the best but a popularity contest. South Carolina State can’t hold a candle to southern!!!! !